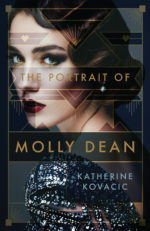 Katherine’s first novel, The Portrait of Molly Dean is inspired by the true story of a sensational murder. It is set partly in the bohemian art world of 1930s Melbourne and was published by Echo, an imprint of Bonnier Publishing Australia in March 2018. (Rights available: Film & Television). Katherine’s new novel Painting in the Shadows: an Alex Clayton Art Mystery (Echo Publishing) is now available. Alex and her friend, conservator John Porter are thrilled to be previewing the Melbourne International Museum of Art’s newest exhibition, until they witness a museum worker collapse and badly damage a painting believed to be cursed. Belief in the curse is strengthened when MIMA’s senior conservator Meredith Buchanan dies less than twenty-four hours later while repairing the work. Alex and John follow the trail of a mysterious painting that could hold the key to Meredith’s death and the stakes are raised when Alex is offered her dream job at MIMA. Damaging the museum’s reputation will jeopardise her professional future. The friends soon realise they are facing an adversary far more ruthless than they had anticipated and there is much more at risk than Alex’s career. “A captivating story of murder, intrigue and a mysterious painting” – Emma Viskic.